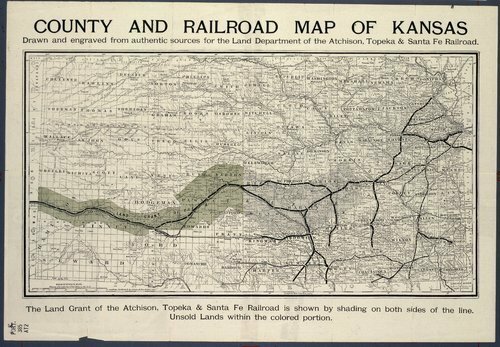 A detailed map of Kansas showing the grazing lands of the upper Arkansas Valley and the land grant of the Atchison, Topeka and Santa Fe Railroad. This is a brochure promoting immigration to Kansas and advertising the advantages of land purchase there. Climate, market, crops, schools and livestock are all detailed.